New images from the HRSC camera on board the Mars Express spacecraft show numerous dried up river valleys and various former crater lakes in the Acidalia Planitia region. They are further evidence of the existence of water on the surface of Mars for an extended period of time. Such areas are of particular interest to the search for microbial life, which may have developed here under these circumstances. Former crater lakes and dendritic river valleys in Acidalia Planitia - a place for microorganisms? 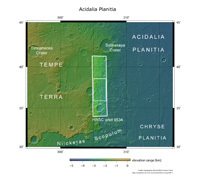 The images from the High Resolution Stereo Camera (HRSC), carried on board ESA's Mars Express spacecraft and operated by the German Aerospace Center (Deutsches Zentrum f�r Luft- und Raumfahrt; DLR), were acquired on 21 June 2011 and show the transition zone between the western edge of Acidalia Planitia and the Martian highlands. 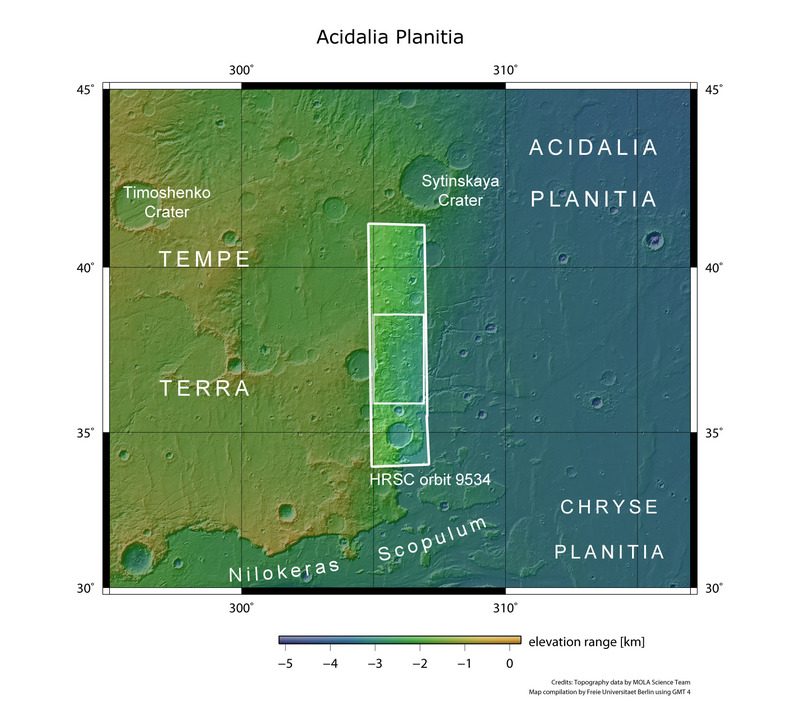 Acidalia Planitia is a plain in the northern lowlands, lying between the Tharsis volcanic province and Arabia Terra, to the north of the Valles Marineris. The famous Cydonia region (the 'face on Mars') is also located in the Acidalia plain. The imaged region covers an area roughly 150 by 70 kilometres, making it a little larger than the island of Crete. Acidalia is the name of a spring in Boeotia (modern Attica) in central Greece where, according to legend, Venus, the goddess of love, frequently bathed with the Graces. For this reason she is sometimes referred to as 'Acidalia' (Venus Acidalia). There are numerous river valleys in this section of the transition zone from the Martian highlands to the northern lowlands of Acidalia Planitia. Some of these valleys show what is referred to as a dendritic pattern, imitating the shape of the uniform branching of a tree. Such flow patterns occur as a result of precipitation, in the form of rain or snow, for example. The existence of dendritic outflow systems on Mars indicates that the planet once had a different, presumably warmer and more humid, climate - at least at some point in time. Isolated fractures in the Martian crust are visible in the upper section of the images - on the right hand side. They continue into the neighbouring Idaeus Fossae region (outside of this image). Water stored in subterranean cavities may have escaped from these fractures. To the west, in the upper section of the image, several craters 10 to 20 kilometres wide and filled with sediment can be seen; this is the origin of some of the river valleys. It can be assumed that the craters were once filled with water, forming lakes. In the central section of the images there are several smaller, very well preserved craters. These were presumably formed after the water activity ceased and thus were not filled with water and eroded, nor were sediments deposited there. Regions like the one shown here are of great significance for the search for life on Mars. The clear markers of crater lakes are evidence of the presence of surface water in the past history of Mars. Sediments from such lakes are of particular interest to astrobiological research, as the existence of water over extended periods of time is a prerequisite for the development of microorganisms. 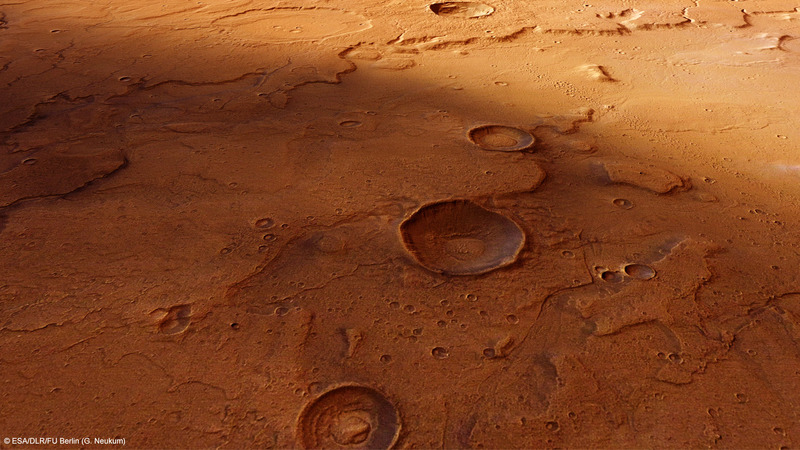 These HRSC images were acquired during Mars Express' orbit 9534. The image resolution is about 15 metres per pixel. The images show a section at 37 degrees north and 306 degrees east. The HRSC camera experiment on the European Space Agency's Mars Express mission is headed by Principal Investigator (PI) Professor Gerhard Neukum (Freie Universit�t Berlin), who was also responsible for the technical design of the camera. The science team consists of 40 co-investigators from 33 institutions in ten nations. The camera was developed at DLR under the leadership of the PI and it was built in cooperation with industrial partners EADS Astrium, Lewicki Microelectronic GmbH and Jena-Optronik GmbH. The instrument is operated by the DLR Institute of Planetary Research in Berlin-Adlershof, through ESA/ESOC. The systematic processing of the HRSC image data is carried out at DLR. The images shown here were created by PI-group at the Institute of Geological Sciences of the Freie Universit�t Berlin.